The climbing at Crowders Mountain State Park is widely regarded as some of the best in the Central Piedmont. There's a range of difficulty, from near beginner to expert. Free self-registration located at each park entrance. Crowders Mountain State Park is home to two separate peaks: Crowders Mountain and Kings Pinnacle. The summits of each stand more than 600 feet above the piedmont, providing long distance views that reach Kings Mountain and uptown Charlotte. 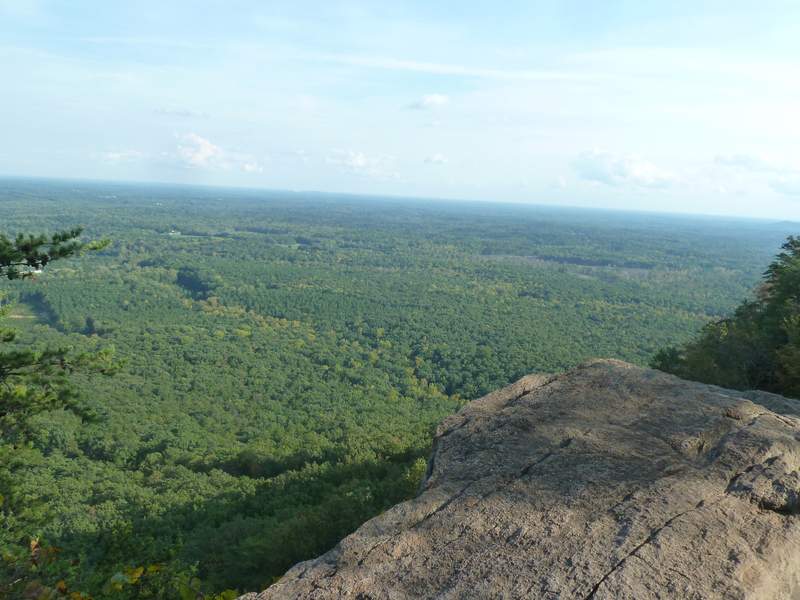 While Kings Pinnacle is a great place to hike, Crowders Mountain is the place for climbing. The roughly 100 routes at Crowders are located in two general areas: Hidden Wall and the Main Wall. The Hidden Wall, holding many of the park's most difficult climbs, is located along the Rocktop Trail. While it’s not as large as the Main Wall, the Hidden Wall is often less crowded. Further up the trail, at the top of Crowders Mountain, the larger climbing area holds a huge variety of climbs at a wide range of levels. Among the most popular areas are David's Castle, a great spot for easier trad climbing, and Practice Wall, one of the best areas for a top rope. You can assume that Crowders will be busy most weekends of good weather which is why it has been given the nickname “Crowded Mountain”. Helmets are essential in all climbing, but maybe more so at Crowders. Since the hiking trails lead to the top of the main walls, expect an audience while climbing. Unfortunately this can also lead to careless hikers accidentally kicking rocks off the top or, at times, even purposefully tossing the occasional bologna sandwich. Because of its proximity to Charlotte, its moderate approach, and its range of routes, Crowders is where many new climbers first tackle outdoor climbing. Many weekends find local guides showing gumbies the ropes. Several more experienced climbers and clubs meet at the mountain as well, since it holds challenging routes as well. To access the main climbing area at the top of Crowders, the quickest approach is from the Linwood Access parking lot. The lot has bathrooms and water. Leashed dogs are allowed on the trails at Crowders Mountain State Park. Check the website for seasonal hours of operation.